The information and materials on this website (hereinafter the “Information”) is for general information purposes only and does in no way constitute any kind of advice. 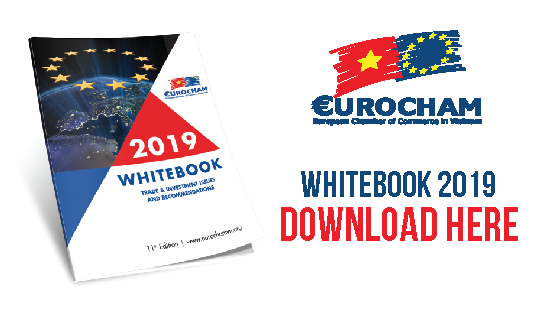 The European Chamber of Commerce in Vietnam, its legal representative, managers and employees (hereinafter “EuroCham”) does not represent, warrant or guarantee, whether explicitly or implicitly, the completeness, accuracy, reliability, suitability or availability of this website and of the Information. Users of this website should not act upon the Information without seeking professional advice and/or assistance and EuroCham does not accept any responsibility or liability to users and/or any third parties for the use of the Information. The entire content of this website, including without limitation any architecture, texts, photographs, illustrations, software and publications, is the property of EuroCham and/or its technical service providers, as the case may be. All rights are reserved. No Information may be reproduced, distributed or transmitted, in whole or in part, in any form or by any means, without the prior written consent of EuroCham. For permission requests, please write to EuroCham at the address mentioned below. Any representation or reproduction of all or any part of this website by any means whatsoever that has not been expressly authorized by EuroCham is unlawful and qualifies as an infringement under all applicable laws, including Vietnamese intellectual property law. Protection against any viruses is the users’ own responsibility. Any links on this website to any third party’s website, information, materials, products and/or services are for convenience only. EuroCham does not publish or monitor the sources or contents of such links and the provision of any link on this website does in no way constitute an express or implied recommendation and/or endorsement by EuroCham of the information, materials, products and/or services that that can be accessed via such links. EuroCham does not accept any responsibility or liability in this regard. EuroCham does not take any responsibility, and shall not be liable in any way, for this website being temporarily unavailable due to circumstances beyond its control. EuroCham reserves the right to amend this disclaimer notice from time to time, and any revised version will be deemed to be applicable from the date of publication on this website.